Everywhere, especially in the auto business, it is necessary to be punctual. Punctuality is your quality mark. When customers see that you are a responsible seller, you win their trust. It will be much easier for you to find new clients and keep existing ones. 1. Don’t give unreasonable promises. Don’t guarantee things that you are not able to do. For example, It’s unnecessary to write “we are available at any time” if you do not have 24-hour support team. Never leave a client with no information about what’s going on. If you have unexpected delay – report about it; if you can focus on client’s request only after certain time – ensure customer that his request definitely will be done. If task takes less than 5 minutes, do it right now. SMS to the supplier, signature of а current document, call to the partner – all of this can take a little time but if you do it late or even forget, this can have very negative consequences. 4. Demand punctuality from others. 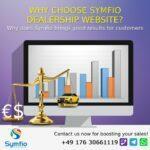 The company is helping dealerships to make their presence in Internet more effective.